Total suspended solids (TSS) problems? Unfortunately, it is everywhere. However, if you are dealing with TSS issues on your industrial site, there are some things you should know about where it might be coming from and what you can do about it through best management practices (BMPs). Don’t worry, all is not lost when it comes to dealing with TSS. This three-part series is going to dive into the details of TSS from the analysis in the laboratory and what TSS can do to the environment, to potential sources of TSS on your industrial site, to, finally, some solutions or BMPs for your industrial facility. First off, a little background on TSS. TSS is defined as the suspended particulates in storm water with a diameter greater than 1.5 microns that does not pass through a glass fiber filter. The suspended particulates that are used to determine a TSS concentration include both inorganic and organic constituents. That means those little pieces of mulch or silica sand both count towards a TSS concentration in a water quality sample. Samples for TSS analysis are collected using a clean, plastic bottle with no preservative and sent to a laboratory. In the laboratory, the storm water sample’s volume is measured and then filtered through a glass fiber filter. 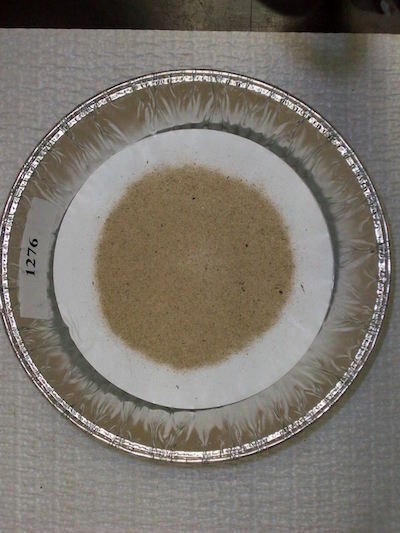 The filter(s) and suspended materials that are captured are dried in an oven and the mass recorded after drying. The end TSS result is mass (milligrams [mg]) of solids over the volume of the sample (liters [L]) and is reported in milligrams per liter (mg/L) for industrial storm water general permit (IGP and ISGP) and multi-sector general permit (MSGP) purposes. For IGP and MSGP, there is typically a benchmark of 100 mg/L for TSS. For example, the U.S. Environmental Protection Agency’s MSGP, which is used by Massachusetts, New Hampshire, New Mexico, Idaho and Washington, D.C., has a TSS benchmark of 100 mg/L. Likewise, Washington and Oregon also use a TSS benchmark of 100 mg/L and California’s IGP has an annual Numeric Action Level (NAL), basically a benchmark, of 100 mg/L. However, for 303(d) or impaired water bodies in Washington, a benchmark of 30 mg/L is used and in California, the instantaneous NAL is 400 mg/L, meaning two samples with TSS concentrations of more than 400 mg/L is an exceedance. Without getting too much in the weeds on an individual state’s permit specifics on TSS concentrations, it is useful to know that 100 mg/L is generally the benchmark in the U.S. Besides the regulatory driver of benchmarks and exceedances, there also is an environmental driver for why TSS matters on industrial sites. TSS in storm water discharges to water bodies can have a huge impact on the aquatic ecosystems in those water bodies, includes filling in streams, thus reducing channel depth; clogging fish gills, which can kill them; and, impairing light, which can harm aquatic vegetation. If TSS constituents are organic in nature, the breakdown of the organic particulates can reduce oxygen in the water body thus harming aquatic invertebrates and other organisms. For industrial sites, TSS may be everywhere and that can lead to some frustration from company owners and environmental managers as to why they have to “deal with it.” However, there are both regulatory and environmental drivers for understanding and managing TSS in industrial storm water discharges. In our next part of the series, we tackle potential sources of TSS. Some which you probably already can think of, such as construction sites, and some which are not so obvious, such as truck tires.